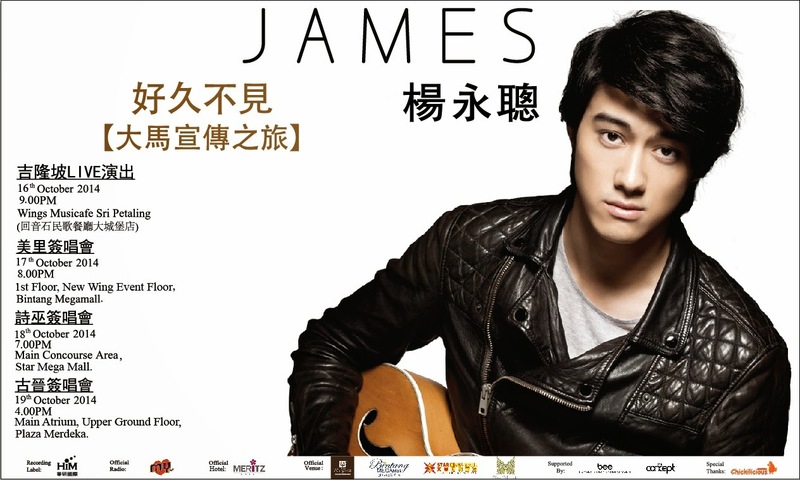 Kuala Lumpur, October 2014 - James楊永聰 will be coming over to Malaysia for the fourth time this 16th October 2014 to meet and greet with the fans. Following his success with the song of “好久不見”, he has gained a lot of supports and fans base. This time, despite having a busy schedule, James楊永聰 will be coming over to Kuala Lumpur to have his one & only LIVE show. He will be singing and playing the instrument simultaneously to present his sincerest performance to the fans! After finishing his LIVE Show in Kuala Lumpur, James楊永聰 will be rushing to East Malaysia Sarawak to meet the fans there. First time having his promo tour in Sarawak, what are the surprises that James will bring to the fans over there? Let’s check out the event there! For more info, please stay tuned to the official radio station, MY FM & Facebook Official Page,“大馬華研HIM Music Malaysia”. 大馬華研HIM Malaysia hotline: 03-7957 6695.